This year we spent ten minutes a few days a week exploring the world, and it was BY FAR my kids favorite morning activity of the whole year. This workbook is so simple to put together, just print out this ONE downloadable sheet and slide into a sheet protector. Then find and print out a list of the names of all the countries in the world, a graphic of world flags and a blank map of the continents. Use sheet protectors so that the kids can write and wipe their daily discovery! We also added coloring cards for each country (index cards) with the country name, capital and flag. The kids put them in jars by contients. They also marked off their countries with stickers on our world map. 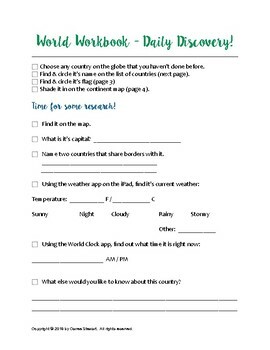 Another great resource is Kathy Troxell's Geography Songs. My kids have enjoyed memorizing regions of the world and exploring God's nations with this easy, fun activity. The Shifu Orboot interactive globe was a really cool addition to our exploration. I hope you enjoy this activity as much as we did!